York South-Weston MP, Mike Sullivan pulled no punches when he announced his private member’s bill in Cruickshank Park today. Normally, building projects that affect the Humber must undergo an environmental assessment. During last year’s federal budget, the government removed this requirement from hundreds of Canadian rivers including all of the Humber and its tributaries, north of Bloor. As previously mentioned in Weston Web, private members’ bills rarely become law because in this case, the majority Conservatives will vote against it. The tactic is commonly used to raise awareness of a concern and this appears to be the goal of Sullivan and his party, the NDP. Sullivan would like protection restored to the Humber which is one of Canada’s heritage rivers. To make his point he even waded into the river in rubber boots. Sullivan believes the reason protection has been removed from the Humber is so that companies will have an easier time when building projects on sensitive land such as the Humber watershed. Enbridge, for example will have an easier time increasing the flow rate in one of their pipelines which travels through the Humber watershed. Mike Sullivan standing in the Humber. 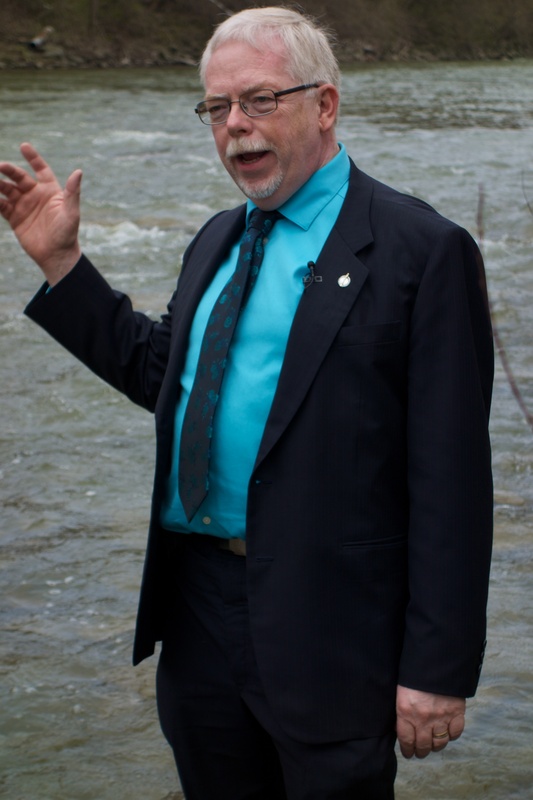 Toronto and Region Conservation Authority board member Mike Mattos talked about pollution entering the river from a variety of sources and the need for more protection not less. If the pipeline ruptures, as some have in the past, said Mattos, it could take hours before the flow is stopped. Mary Louise Ashbourne with a map of the Humber Watershed. 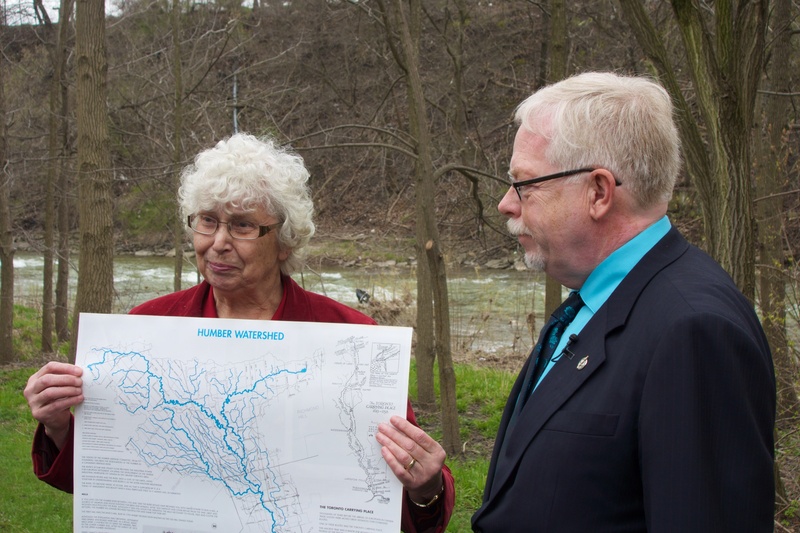 Mary Louise Ashbourne, President of the Weston Historical Society emphasized the important part that the Humber has played in Canadian history and was of the opinion that while all rivers in Ontario are important, designated Heritage rivers such as the Humber deserve special protection. Sullivan was handing out petitions supporting his argument that he will take to Parliament. Download a copy here. A YouTube video of the news conference is available here. The openparliament.ca transcript of the bill’s introduction by Sullivan is here. This is good move by Mike..I like it. Unfortunately the Cons. will trash it as usual.